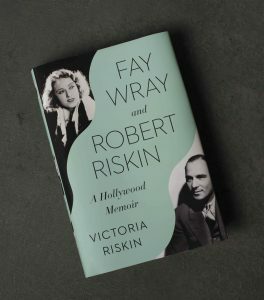 Victoria Riskin’s memoir of her extraordinary parents, actress Fay Wray and screenwriter Robert Riskin, is a joy to read. This insightful, revealing, and often moving portrait of two of Hollywood’s legendary creative people is also a talented daughter’s exploration of her family and attempt to better understand the lives and influence of her parents on her and on our culture. Fay Wray is best known as the beleaguered heroine of the cult classic King Kong, but she had a long, varied, and distinguished acting career from silent films (most notably Erich Von Stroheim’s The Wedding March) through many other features and television programs. Robert Riskin is celebrated as the brilliant writer of many great films directed by Frank Capra, including It Happened One Night (which won Riskin an Oscar and also won the Oscar for best picture), Mr. Deeds Goes to Town, Lost Horizon, Platinum Blonde, and Lady for a Day. Riskin’s many other screenplays and his important work producing a series of films about the American experience for the U.S. government in World War II are also examined in the detail they deserve. These two glamorous, successful, and witty people came together in midlife in a romance that turned into an enduring marriage of mutual strengths. The dynamics of that unusually happy Hollywood love story are beautifully captured by Victoria Riskin. The author, an accomplished screenwriter herself and a past president of the Writers Guild of America, brings her lively and entertaining and keenly observant writing skills to telling this story. She explores the bittersweet aspects of her parents’ lives with care and candor, including her father’s debilitating illness, her mother’s determination to return to work and her long and rich life after that marriage, and the complex and sometimes controversial issues of authorship surrounding the Riskin-Capra films. “The result is a Hollywood memoir of rare depth and sensitivity that should be of great interest to those who love film history as well as to general readers who are interested in films and the behind-the-scenes stories of the people who made the classics we cherish. All will be captivated by this splendid dual biography of two of Hollywood’s most fascinating and enduringly important and colorful personalities.